Your Price: Freight cost is $400 flat rate in the U.S.A. In keeping with it tradition since 1991, SunRise Imaging continues to lead the microfilm industry by incorporating the latest in technology in its new family of products. The SunRise 3-in-1 scanners, SpeedScan and RapidScan, offer the powerful new ScanFlo application that takes addvantage of the latest in hardware and operating system platforms. 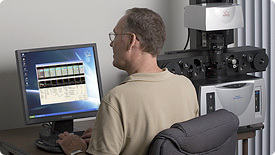 The new generation of SunRise microfilm scanners incorporate the latest in computing hardware. All models come with an integrated computer, running Microsoft® Windows® XP Professional operating system. The graphic display interface in the SunRise scanners allow the use of standard analog or digital displays. A 17", or larger, with a minimum 1280 x 1024 resolution is recommended.